DVD version with compatibility fixes plus DOS version. 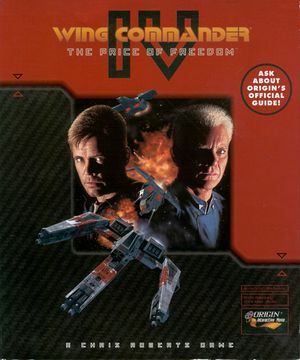 The GOG.com version includes both the DVD version and the original DOS version (available under bonus content). WSG_NDX.WSG is a save index and must be present to load saves. 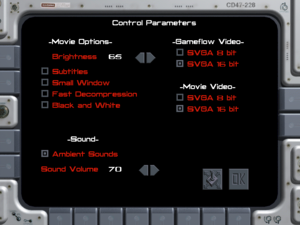 Control Parameters (via Main Terminal). On/off only; set in in-flight settings (Alt+O). Disabled by default. DVD version has no subtitles for movies. The GOG.com version's movies are much quieter than gameplay due to the AC3Filter configuration used. Delete or rename the AC3Filter folder. The default system decoder will now be used. If movies are still too quiet install AC3Filter and increase the Gain slider. 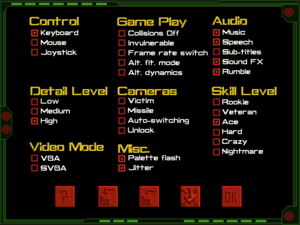 For DVD releases of the game, a Pentium MMX 166 MHz processor is recommended. The higher quality DVD-Video release of the game only works with specific Creative MPEG-2 cards outside of the GOG.com release.